Over ten years after Brussels became a European Capital of Culture (ECoC) the simultaneous European, Belgian and Flemish capital city finds itself deep within a political and cultural crisis, without a functioning government and without a unified cultural policy moving forward. As a multicultural, officially trilingual and multi-layered federal state, and as an immigrant-receiving nation with a colonial past, Belgium is an intriguing setting in which to study culture and cultural policy. As its capital city—one of the most ethnically diverse of European cities—the seat of European government; and as a leading European centre of visual and performing arts, Brussels embodies the challenges and possibilities of diversity facing many cities today, itself a complex intersection of mono-, multi- and euro-cultural spaces both discursive and territorial. Further, the cultural programmes of Brussels are directly impacted by a structurally-imposed language divide between Belgium’s French and Flemish Communities (Communautés and Gemeenschappen, in French and Dutch, respectively), and the ability of Brussels to carry out its tenure as a Capital City of Culture in 2000 was often troubled by this divide which played out in many discussions and decisions about how Brussels would be represented locally and externally for the millennial year ECoC events. This paper describes Brussels 2000(2) —the ECoC programme of the capital ville-région(3), the French and Flemish policies which separate and control the city’s cultural and artistic scenes; and attempts by local individual and institutional actors to find common ground in a city long divided by the politics of language and cultural identity. Source: Author’s rendering from http://en.wikipedia.org/wiki/Brussels. 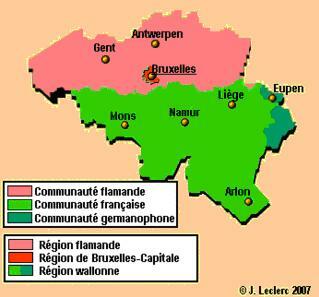 The area of ‘Culture’ is constitutionally the exclusive domain of the Flemish and French Communities including within the bilingual territory of the Brussels-Capital Region. (Author’s translation of Belgian Senate, 2009, Belgian Constitution rev. 1994, art. 127 § 2). Simply stated, there is no single authority responsible for setting cultural policy in Brussels. As the governing bodies over culture, the COCOF and VGC have the primary responsibility of ensuring that each of their Communities’ cultural policies are carried out within the territory of the Brussels-Capital Region. The artistic and cultural agendas of these Commissions are linked to education and training offering various and separate visual and fine arts academies in addition to numerous socio-cultural organisations and other artistic projects, courses and workshops in the Capital Region. Across Brussels’ 19 municipalities, both Commissions support their own networks of cultural activities and centres. For example, the Services culturels du Ministère de la Communauté française formally recognizes and financially supports nine Bruxellois cultural centres in their operations and in their socio-cultural programming, including neighbourhood-based cultural centres throughout the Capital Region(4). On the Flemish side, no fewer than 22 community cultural centres exist in Brussels. In addition to these Community-led centres, other cultural centres abound in Brussels representing its ethnic and linguistic diversity beyond the two official Communities (Centre d’Informatique pour la Région Bruxelloise, 2011). Interestingly, each Commission has devised strategies to reach out to and fund immigrant and immigrant-origin cultural actors (including artists), such as the Vlaams-Marokkaans Culturenhuis (a Flemish-Moroccan cultural centre) and the Espace Magh (a French Community-sponsored projet artistique ) to name but two. Brussels’ main cultural institutional actors themselves fall into three distinct categories: federal institutions, French or Flemish organisations, and facilities and organisations run by the different communes (Cogliandro, 2001). Though some recent gestures(5) towards a shared cultural agenda have been made by the French and Flemish Ministers of Culture for Brussels, their Communities share neither a common cultural policy nor a formal agreement in matters of the arts or culture. Though this recent gesture suggests possible change, what relationships do exist between the two Commissions are mired in a history of non-cooperation. Originally conceived as the European City of Culture programme in 1985(6) by Merlina Mercouri and Jacques Lang—then, Greek and French Ministers of Culture, respectively—the European Capital of Culture (ECoC) programme is an EU?wide economic redevelopment effort to transform the cultural base of selected cities which, in turn, provides socio?economic benefits to their residents. A 2004 study, requested by the European Commission, found that these culturally?led initiatives are successful in stimulating both economic and social growth in the cities selected (Palmer-Rae Associates, 2004). While there is ample research into the cultural, socio-economic and urban roles of the ECoC programmes overall and in many selected ECoC cities (Sykes, 2011; Ingram, 2010; Richards & Palmer, 2010; Langen & Garcia, 2009; Sassatelli, 2007; Miles, 2007; KEA, 2006) beyond the Palmer-Rae (2004) and Cogliandro (2001) reports, surprisingly little research has been conducted on the particular case of Brussels 2000. A great challenge of Brussels 2000 was to overcome the structural barriers obstructing any unified cultural project for the city-region and its nearly 1 million residents (Flemish, French or otherwise). Brussels 2000, funded in large part through public sources such as the national lottery, was intended to reflect (and to benefit) the entire Brussels region. With the view of realising a regional Brussels ECoC project, the troubles with Brussels 2000 arose early as the organisers—a governing board of directors, chaired by François Xavier de Donnea (Mayor of Brussels in 2000)—were immediately confronted with a disjointed public authority structure in the cultural arena: Brussels région with its 19 communes (gemeenten) each with their own administration and Mayor(7). In its in?depth coverage of Brussels’ organization and staging of events for the 2000 celebration, the EU-commissioned Palmer Study (2004) identified several key aims and objectives of the Brussels 2000 initiative. Among the aims identified as of highest importance were: social cohesion and community development and “enhancing pride and self?confidence.” Other stated objectives included, “encouraging collaborations and synergies between different existing cultural actors”—something that heretofore had been clearly missing from most socio-cultural initiatives in Brussels to date (Palmer-Rae Associates, 2004). In the case of Brussels 2000, culturally?based initiatives were used as ways of promoting long-term solidarity across disparate interests and diverse groups towards a common goal where “cultural provision has a potential for democratisation and intercultural collaboration, which may inform other areas of social formation and power relations.” (Miles, 2007, p. 138). Embracing ‘cultural diversity’—including Belgium’s own French and Flemish linguistic diversity—in Brussels meant that a Brussels 2000 would be the first major cultural programme involving the two French and Flemish-speaking artistic communities together (Cogliandro, 2001). Despite a generally optimistic tone of the overall Palmer Study (2004), several findings related to Brussels 2000 show systemic challenges throughout the planning process, from its “over?emphasis” on the theme of social cohesion, to the political in?fighting, to the lack of representation on its Board of Directors by 18 of the 19 municipal authorities of the Brussels?Capital Region. Finally, the Palmer Study (2004) uncovered doubts among those interviewed as to whether the social projects would be sustainable and found that, at least in 2000, the social programme was not well integrated into the general cultural programme, which begs the question: How can we expect to achieve social cohesion among the public at large when the organisations espousing such beliefs are themselves unwilling or unable to embrace these goals internally? Despite some significant organisational missteps, Brussels 2000 reflects a major effort by local actors to provide an alternative to the status quo of separate cultural policies and programmes for Brussels. In response to the question of cohesion and in reaction to the absence of political action towards collaboration and common policies, several socio-cultural actors in Brussels collaborated and created a unified cultural plan for the Brussels-Capital Region. Where politicians have regularly failed to act, several Bruxellois cultural actors, activists, academics and artists have been working together since the late 1990s to create a first-ever collaborative cultural plan for the city of Brussels. Given that the city’s cultural agendas (and separate funding structures) depend largely on the particular and inward-looking interests of the French Communauté and the Flemish Gemeenschap, this has been no small undertaking. Over ten years in the making, two cultural ‘platforms of cooperation’—the RAB (Réseau des Arts à Bruxelles) and the BKO (vzw Brussels Kunstenoverleg)—drafted a collaborative agreement on behalf of the French and Flemish Communities to work together in the area of culture, which was ultimately supported by over 100 socio-cultural organisations, artists, academic centres and even the European Commission (DG Education and Culture) and foreign interests in Belgium, such as the British Council(8). Their plan (Le plan culturel pour Bruxelles / Cultuurplan voor Brussel) reflects an increase in the number and reach of projects developed in recent years (e.g., KunstenFestivaldesArts, BRXLBRAVO, and the Zinneke Parade) to produce and provide artistic and cultural offerings by and for Bruxellois residents regardless of linguistic background. Even as larger questions of the country’s unity loom large, BKO and RAB, along with like-minded partners, continue to pressure Brussels politicians towards implementing more cooperative policy instruments that will facilitate (instead of impede) cultural projects across the two Communities in the capital city. Brussels was unique among the cities selected as Cultural Capitals of Europe for the recent millennial year. Though the ECoC programme emphasises a chosen city’s ‘European-ness,’ Brussels 2000 leadership elected to undertake an inward-looking, ‘local’ urban project to highlight the complex identities of Brussels as well as to address the many social and economic problems facing the capital ville-région. Such artistic and cultural initiatives simultaneously have reaffirmed and rejected the fragmented socio-political system now stifling Europe’s capital city and the country. Without firm and ongoing commitments by the political actors, the viability and long-term impact of these alternative approaches remain unclear. Further, as one of the first such initiatives, the legacy of Brussels 2000 remains understudied to date. The physical and socio-cultural spaces of Brussels, as conceived in and constructed for the Brussels 2000 programme, reflect a moment in the evolution of local socio-cultural polices and planning of contemporary Brussels when the divided linguistic Franco-Flemish Communities of Europe’s capital city came together to plan and promote a common cultural agenda. Though few socio-cultural projects of Brussels 2000 remain, individual and institutional actors continue to collaborate, but without a shared cultural agenda, their attempts to foster unity in the capital city remain ad hoc and in opposition to the current fragmented policy structure. As public frustration with the lack of political progress builds in Brussels, there is an ever-clearer disconnect between the daily encounters of a multi-cultural, multi-ethnic Brussels Region and the mono-cultural policies which stress open but separate Communities within the same urban spaces. Further, there is a disconnect between the status quo policy-making which reinforces a normative separation in a shared space (the city) where French-Flemish cultural policies compel Bruxellois of all origins to choose sides in culture and education and deny the plurality of cultures and the reality of exchanges and interactions that take place. Therefore, there should be a conscious push for a territorially-based unification (even regionalisation) of cultural policies—where culture is devised by the locality and not imposed by the Communities to the north and south; and common infrastructure overseeing cultural policies, programmes and funding. Separate Community-based cultural policies continue to impose a harmful frontière linguistique on Brussels and its residents, forcing Brussels to conform to the mono-cultural policy structure of the other two Regions instead of adapting those policies to the urban realities of the ville-région itself. Despite the current political climate, there is some recent evidence of openness to revisiting the status quo regarding cultural policy in Brussels. Inspired by the plan culturel (cultuurplan) and for the first time in the 20+ year history of the Brussels-Capital Region, the Flemish and French Communities of Brussels are creating concrete plans to work together in the area of culture. Their statements of an intent to collaborate, and any subsequent longer-term agreements, will require more than infrequent and symbolic exercises of good will, but a commitment to collaboration and a serious consideration of a common geographically- (not linguistically-) based policy on culture. As the country passes its first anniversary without a functioning government, and the European Union struggles with economic wavering and unevenness across its member states, the Belgo-European capital should push forward with developing a local common cultural strategy. Such a vision began with Brussels 2000 and, thanks to the determined efforts of local socio-cultural actors, political actors from both Communities are beginning to publicly promote a more unified and shared cultural cityscape within a wider context of instability and calls for separation. (1) This paper was prepared for publication in the Tafter Journal and reflects a portion of the author’s doctoral thesis work in progress. This paper should not be cited without the explicit permission of the author. For more information on the author’s thesis research, visit https://sites.google.com/site/zinnekestudy2010/. (2) Officially named “Brussels, European City of Culture 2000” (a.k.a., Bruxelles/Brussel 2000), I use the English-language equivalent, ‘Brussels 2000’ throughout this article. 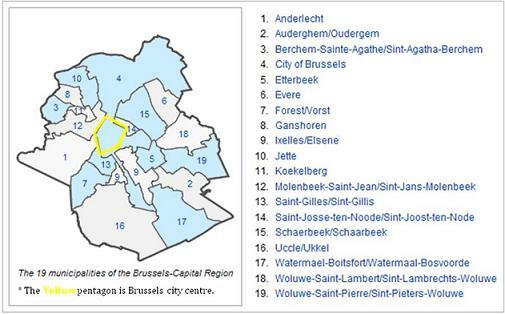 (3) Here, Brussels région refers to the city of Brussels (ville) plus 18 other neighbouring municipalities (communes in French; gemeenten in Dutch), each with their own governing bodies which themselves, though sharing common geography, are divided between French and Flemish authorities serving their respective citizenry also divided along language lines. (4) In all, 13 cultural centres in Brussels (and 104 in the French-speaking Belgian region of Wallonia) are currently accredited by the Association des Centres culturels de la Communauté française de Belgique (ACC). (5) A July 2011 article in La dernière heure reports on the symbolic and unprecedented press conference held jointly by Bruno de Lille and Emir Kir, Ministers of Culture for Brussels. (Dernière Heure, 2011) At the federal level, there is no single Ministry of Culture, but three, one for each language-based Community (including German) in the Belgian Kingdom. (6) The European City of Culture project was officially launched by Resolution 85/C 153/02 of the EU Culture Ministers. (European Commission – Culture: History of the Capitals, 2010). (7) Capitalising on his previous successes with ECoC mega events (such as Glasgow 1990), Robert Palmer was selected as Brussels 2000 General Manager in 1997. (8) Though not signatories to the plan, leadership of the cultural portfolios of COCOF and VGC have been involved and generally supportive throughout the development and ongoing work of the cultural plan. Dernière Heure. (2011), “Politique culturelle: Les francophones et Flamands de Bruxelles vont travailler ensemble”, Dernière Heure. (Retrieved 30 July 2011), http://www.dhnet.be/cine-tele/divers/article/359966/politique-culturelle-lesfrancophones-et-flamands-de-bruxelles-vont-travailler-ensemble.html.